Released in 1979, Nahéma is like an ode to the rose. Nahéma is a rose explosion that calls up the vision of what a rose is supposed to be. In Bottle: Lush rose in that familiar Guerlain smell. Beautifully dense and musky delicate roses. So sweet that for a moment I’m thinking I smell cherry or anise instead but it’s all rose from here. Applied: Big and fantastic and familiar. The rose goes on strong, comes out of the gates yelling and makes itself known. This is what a rose is supposed to smell like. A little sweet, a little floral, clean and dewy. Tea rose is what I’m smelling, and tea rose to me has a lighter, sweeter fragrance often used as a subtle addition but in Nahéma is the primary focus. I get roses for hours and hours as Nahéma has some fantastic staying power. The dry down is a lovely sweet rose on woodsy base and that familiar Guerlain scent. Extra: Apparently, Luca Turin in The Guide shares with us a little rumor. 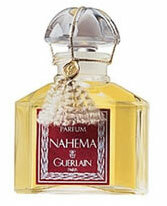 That Nahéma, the greatest rose fragrance in perfumery, was made without any rose oil. Design: The image in this post is not the bottle design that I’m talking about in this section. The modern Nahéma bottle that I held and sprayed is a mostly flat, rather boring bottle design whose shape is reminiscent of Tommy Girl except lacking that third dimension. It’s dull, drab and uninteresting and I wish they hadn’t changed it from the old bottle. But the bottle certainly is functional at least. Notes: Rose, peach, vanilla, woods. Even if you hate roses I highly recommend giving this a sniff. If not so you can find the perfect perfume but to know what conceptual rose smells like. If the rumor is true, that Nahéma doesn’t contain any actual rose oil then the mind-boggling alone is worth a smell. Reviewed in This Post: Nahéma, 2003, Eau de Parfum. This entry was posted in classic, guerlain, oriental, Reviews By House, soliflore and tagged fragrance, guerlain, nahema, oriental, perfume, review, rose, scent, soliflore, vanilla, woods. Bookmark the permalink.